Members please note that your fee for the year 1st April 2019 - 31st March 2020 is now due. FAC holders note that failure to pay your dues may result in your membeship lapsing and the club informing your FET that you are no longer a member which could result in your FAC being withdrawn. Muzzleloaders meet on Tuesday evening from 5:30 at the club range. If you are a muzzle loading afficionado or just curious about how its done please come along. You don't need top own a M/L firearm, club pistols are availailable. 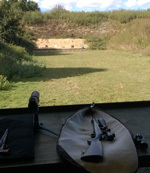 Members now have a regular opportunity to shoot at the Andrews Field 50yd range. This is an historic range; during WWII it formed part of the RAF station and was used to test and align the guns on the aircraft. We shoot on the 2nd Thursday of the month from 1pm-4pm. The post code is CM6 3TH. Click for details. The Roding is an old, established club with a strong membership. It was formed in the early 1970s when it ran under the stewardship of Janet and Terry Rayment. 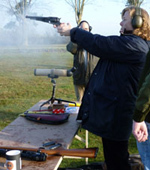 Janet Rayment was formerly a member of the England pistol team. The range, along with the adjacent hall, was built in the early 1930s by a local businessman and philanthropist who was also the Colonel in Chief of the local T.A. The clubhouse is comfortably furnished and was recently re-decorated. We have a number of female members and ladies are always welcome. The clubhouse is a very relaxed place where members can sit and enjoy a chat. Refreshments are always available. The range has five shooting points with returning target holders. It is fitted with a wooden floor, soundproofing and an efficient extraction system. The shooting disciplines we offer are: 10m and 20m air weapons, 20m .22 gallery rifle, 25 yard prone .22 rifle. We also have facilities to shoot up to .38 calibre, both rifle and long barrelled revolver. There is a strong interest in muzzle loading firearms and we have an advancing, turning target available. We have a range of firearms for the use of members including air rifles and pistols, gallery rifles, under lever rifles in both .22 and .38 as well as a .36 black powder revolver . In addition we own larger calibre weapons which members may use at Bisley and other suitable ranges (providing an appropriate committee member is present to transport the firearms.) These include 7.62 rifles and a Hawken .451 muzzle loading rifle.